VMWare has released VMware Workstation 7.1. Support for 8 virtual processors (or 8 virtual cores) and 2 TB virtual disks. Support for OpenGL 2.1 for Windows Vista and Windows 7 guests. Greatly improved DirectX 9.0 graphics performance for Windows Vista and Windows 7 guests. Up to 2x faster than Workstation 7. 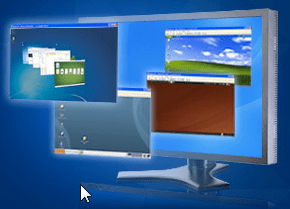 Launch virtualized applications directly from the Windows 7 taskbar to create a seamless experience between applications in your virtual machines and the desktop. Optimized performance for Intel’s Core i3, i5, i7 processor family for faster virtual machine encryption and decryption. Support for more Host and Guest Operating Systems, including: Hosts: Windows 2008 R2, Ubuntu 10.04, RHEL 5.4, and more Guests: Fedora 12, Ubuntu 10.04, RHEL 5.4, SEL 11 SP1, and more. Now includes built in Automatic Updates feature to check, download, and install VMware Workstation updates. Ability to import and export Open Virtualization Format (OVF 1.0) packaged virtual machines and upload directly to VMware vSphere, the industry’s best platform for building cloud infrastructures. Download VMware Workstation HERE. You need a valid VMware Account to download. Heel veel mensen gebruiken MDT om via windows PE boot via PXE Boot om een nieuw OS uit te rollen binnen VMWare. Heel veel mensen rollen standaard een XP of een 2003 machine uit. Standaard kiest VMWare voor de flexible adapter de AMD PCNET32 adapter. Alleen als je de driver gebruikt die standaard met VMWare meegeleverd wordt krijg je de volgende error tijdens het opstarten de Lite Touch Image. De standaard driver die VMWare mee levert in VMWare Tools werkt niet binnen een Windows PE image. Wel als Windows een maal geïnstalleerd is. VMWare heeft VMWare Workstation 7 vrijgegeven door VMWare. – vSphere Support ESX 4.0 Overwegingen voor het draaien van een ESX gast.